Thousands of black youth marched out of their homes and schools in Birmingham, Alabama, and out onto the streets to protest for their rights, on the morning of May 2, 1963. 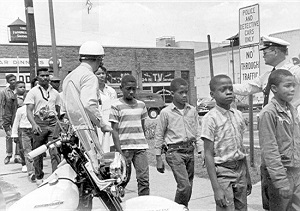 People may not know, but black youth, aged 6 to 17, were just as involved in the Civil Rights Movement as their parents. Youth often went to mass meetings and protests with their parents. Despite their young age, they also noticed segregation, such as separate water fountains, bathrooms, schools, and seats on buses. They even had separate spelling bees and art festivals. Overall, whites had better options. Many children also witnessed bombings and had other traumatic experiences. They called their town “Bombingham.” These kids soon had their own protest. After a previous protest had failed, minister James Bevel brought up the idea of filling the jails with schoolchildren. Some of the other ministers in the church accepted the idea, but others, like Martin Luther King, were hesitant about the idea of sending the youth to jail. A petition to protest was submitted and denied, so they decided to have a march without a permit. Many youth attended nonviolence workshops to prepare. When May 2 came, the kids went to Sixteenth Street Baptist Church. Many youth decided not to go to school. They said goodbye to their parents, as they knew they might not be coming back soon. When all the kids arrived at the church, they had a pep talk and then started to file out of the church in groups. The first group was able to march about a block and a half before they were stopped by the police. They sang freedom songs like “Ain’t Gonna Let Nobody Turn Me Around.” The police put children in paddy wagons—small police vans—and sent them to the city jail. Once they ran out of paddy wagons, they called for school buses. At the end of the day, there were 500-800 young people in jail. The second day was not any better for the marchers. When marchers came, the police officers were already waiting. When officers told them to stop, the marchers refused. Firemen then came with hoses and hosed marchers. Police officers also turned German shepherds on them. Many children were injured. By May 5, the jails were full, and the black community had reached their goal. After the marches, black organizations collected money to bail out the jailed youth. Close to 15,000 other marchers, most of them kids, participated in 758 nonviolent protests in 186 other cities. On May 9, blacks and whites signed an agreement to end racial conflicts in Birmingham, including segregated seats, restaurants, and jobs. On September 15 however, the Sixteenth Street Baptist Church was bombed and four young girls were killed. Clearly, the fight wasn’t over. Anyone can fight for their rights, even children. In this long battle for civil rights, all kinds of people have proven heroic.